I'm pretty new to sourdough bread, but have made some very nice bread with crust and crumb. I've been lurking and learning from this forum. That said, i desire more tang. I've experimented with adding 1/2 tsp citric acid per loaf and 16 hour fridge proofs, which has helped...but I still want more and better tang. I have read the pro/cons of pre-fermenting is various %'s and/or buying a supposedly really sour starter. My basic approach has been Robertson's but with hydration increased to 80%. I am quite happy with the bread other than I want more tang. So any suggestions of things to try, directions to head, etc will be greatly appreciated. Loren, Debra Wink is the established expert on this site, and here is her summary of the factors involved in making bread more or less sour. https://brodandtaylor.com/make-sourdough-more-sour/ Like you I am in search of sour. My goal is to eventually get to be able to get a recipe and process to the point it is too sour, and then dial it back a bit. Right now, I am mostly hit and miss, though I complicate the matter by using only 100% home milled white wheat flour without sifting, so it is pretty easy to get a loaf that is on the dense side. She does not mention it here, but I have read that the hydration of the starter can also factor into it. I have been trying low hydration starters with a modicum of success, though in just rereading this post, http://www.thefreshloaf.com/comment/94117#comment-94117 I think Debra suggests high hydration starter will increase sour, so I will try that next. Tang basically comes down to how long your dough proofs. The longer it proofs, the more tang. The balancing act, of course, is that you don't want to over-proof your dough, or you get little or no oven spring. So... proof at lower temperatures for longer. It's probably that simple. Use as little starter as possible, wait until a pinch passes the float test, then mix/stretch/fold/shape your loaves, and pop them in the fridge until they are properly proofed. Bake. I almost guarantee that will do the trick. Although there is some art to this, the fundamentals are pretty simple. Slower and longer proofing means more tang. Now you just have to control the variables to avoid over-proofing. That means less starter, and lower temperatures. I am a self confessed “sour freak” :-D Like Barry, I have never produced a bread that was too sour, but I have been fortunate to consistently bake bread that is intensely flavored and caters to the smoothness that is produced by lactic acid. As the bread is chewed the flavors build in the back of the tongue. The bread begs to be eaten! It has taken me years to find the right flavor profile. and truth be told, I never did figure the mystery out. I stumbled upon it when I took an on-line course from Teresa Greenway of Northwest Sourdough. During my search, I learned there are 2 distinct flavor characteristics with many possibilities inbetween. It is possible that most sourdough bakers are not aware of the different types of sourdough flavor that is available. From what I read, most bakers are striving to increase the degree of sour, and unaware of the different sour profiles. The LAB (bacteria) can be coaxed to promote acetic (think sharp cheddar cheese) or lactic (mild cheddar) by a number of methods, such as hydration, grains, and most importantly - fermentation duration and temperature, as Diving Dancer stated. Unlike Barry, my breads derive their flavor from extended warm fermentation. Keep in mind, both the course and my flavor preference is a smooth lactic favored sour. The course does not cater to the acetic sour that is produced by retardation (cold fermentation). - build a 24-hour levain, eg 1:10:10 (5g starter, 50g flour, 50g water), I've gone as high ratio as 1:15:15; it might collapse about 16 hours in, that's okay. The above is a lot easier if you build a bread at hydrations below 65%. The article also suggests a stiff starter would be helpful, I haven't much experience with this. The vinegar flavor will be built by keeping the dough 85F or higher for as long as you can. If the vinegar flavor gets to strong, the bread may taste spoiled. If you are accustomed to taking a small piece out from the levain builds to continue your starter, don't build too many high ratio ones like this in a row, otherwise you will end up with a starter that's too acidic and your bread will turn to goop before if has a chance to properly ferment. I too have been trying to get more sour! 8 hours before mixing, prepare a 100% hydration liquid levain. Use 20% of the total water in the whole dough recipe. Leave at room temperature. Add remaining flour, water, and salt. I have a really goopy dough that is bulk fermentating right now. I'll report back with results. Bart, I would be interested to see the entire formula. Off the top my of my head without doing any calculations, you’ve got me scratching my head. Let’s base the dough on 1000g flour and choose 70% hydration. So the available water is 700g. Considering a 100% starter (innoculation source) the total flour in the levains is 588g. The total flour prefermented is 59%. That is extremely high, but that is not what makes me question this formula the most. To ferment a levain (biga) for 72 hours, it has to be done at cold temps. It is not possible for the levain to survive such an extended room temp ferment without degrading to complete and unusable slop. By my calculations 63% of the total flour exist in the 50% preferment. Are you sure the author recommends fermenting the stiff levain at room temp? Am I missing something? I am an inquisitive type and always ready to learn new things and correct errors in my thinking. Please check your information and also my calculations and assumptions. If I am wrong, it will be great to learn something(s) new. You are not being rude...we are learning together. I said in my original post that I was in the middle of an experiment. I am 4 hours into bulk fermentation, and the dough is still pretty goopy after several stretch-and-folds. Here is the page from the book. Let know if I got something wrong. Interesting, Bart. 42% of the total flour (not including the flour in the innoculation starter) should, by my assumptions be completely degraded and unable to bring any food or strength to your dough. How would you describe the appearance of the stiff starter when it was mixed into the dough? I don’t own The Bread Builders Book, but as far as I know the arthors are highly respected. I’m puzzled! 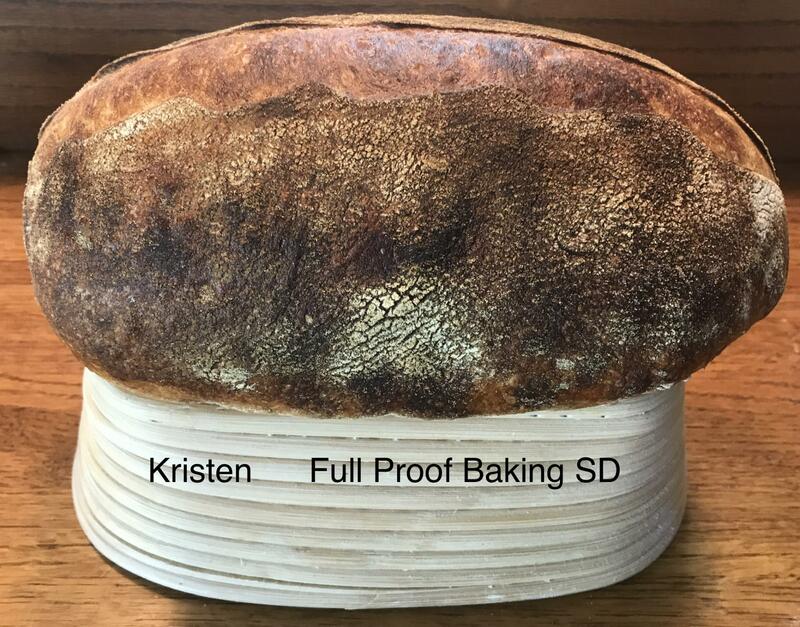 The authors make sense when they say that the dry levain will bring loads os acid and the relatively young (wet) starter will provide the yeast. I get that 100%. I just can’t imagine a starter fermenting for 72 hours at room temp without being refreshed. I would expect your dough to be completely unmanageable at your stage of Bulk Ferment. Can you handle the dough? How would you describe the strength of the dough? I'll try again next week with a shorter period for the stiff levain...stay tuned. Bart, it often pays to bake the dough anyway. Today I loaded a loaf that was very slack, but it got a huge oven rise. I get surprised from time to time. Try lowering your inoculation, this is a sure fire for me! Just beware that the bulk fermentation will take longer but you will get more acid in the final dough. If you want more tang in your bread get some lactic acid powder and add just a pinch to your dough. A little goes a long way! Too much and it will taste odd. You could also add a few drops of vinegar. See my blog. Lactic acid and acetic acid are what a sourdough starter produces and which make the bread sour, so those souring agents are in the dough anyway whether they come from a starter or are added by the baker. It's a lot simpler than spinning your wheels with experiments in biochemistry and hocus-pocus trying to make a starter. Lactic acid powder is available from that major e-tailer. You might also try adding 1/4 tsp of diastatic malt powder to your dough. Many times I have successfully made sourdough bread with a starter and was quite satisfied with the results. The last time I made sourdough with a starter I prepared the starter as usual. It was all bubbly and foamy and I thought it was ready to go — except that it lacked the familiar aroma I had learned to expect. I baked it anyway and the bread rose just fine. Unfortunately, the finished loaf had none of that familiar sourdough tanginess. In fact it had no sour flavor at all, like a regular French baguette. From then on I have used my starterless recipe and have not looked back.